At Codefresh, we know that any CI/CD solution must be attractive to both developers and operators (SREs). One of the major advantages of Codefresh is the graphical user interface that includes dashboards for Kubernetes and Helm deployments. These graphical dashboards are very useful to developers who are just getting started with deployments and pipelines. We realize, however, that SREs love automation and the capability to script everything without opening the GUI. 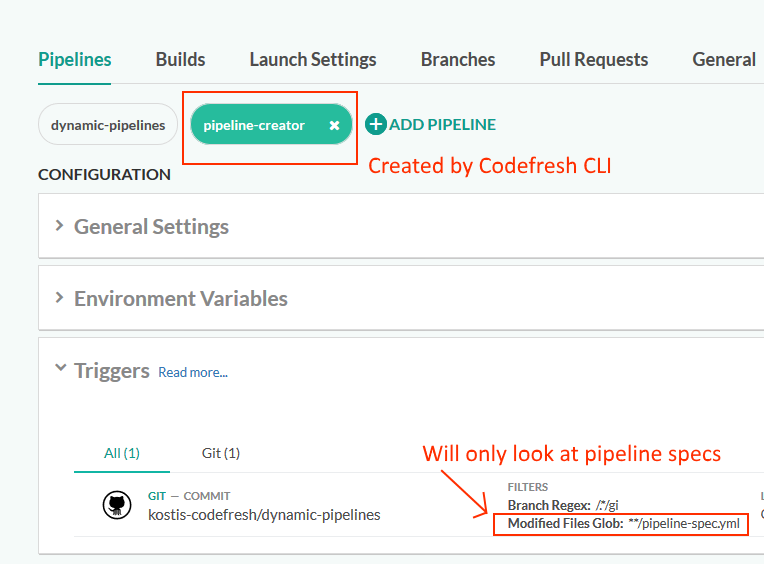 To this end, Codefresh has the option to create pipelines in a completely automated manner. We have already seen one such approach in the first part of this series where pipeline specifications exist in a separate location in the filesystem outside of the folders that contain the source code. In this blog post, we will see an alternative approach where the pipeline specification is in the same folder as the code it manages. Imagine that you are working for the operations/SRE team of a big company. Developers are constantly creating new projects and ideally, you would like their pipelines to be created in a completely automated manner. Even though you could use the Codefresh GUI to create any pipeline for a new project by hand, a smarter way would be to make Codefresh work for you and create pipelines on the spot for new projects. In all of these steps, the Codefresh UI is NOT used. Even the “pipeline creator” pipeline is created outside of the GUI. The building blocks for our automation process are the same ones we used in the first part of the series. We have seen the details of these basic blocks in the previous blog post, so we are not going to describe them in detail here. First, we will start with the most crucial part of the whole process. The pipeline creator. Here is the spec. description: "Pipeline creator for pipeline-spec.yml files"
This line comes from the monorepo support and essentially instructs this pipeline to run only “when a file named pipeline-spec.yml is changed in any folder”. The name we chose is arbitrary as Codefresh pipeline specifications can be named with any name that makes sense to you. This line guarantees that the pipeline creator will only run when a pipeline specification is modified. We don’t want to run the pipeline creator when a normal (i.e. code) commit happens in the repository. Here we call the Codefresh CLI and create the pipeline that will actually compile the project. There are multiple ways to locate the file that contains the pipeline, but for illustration purposes, we make the convention that the branch name is also the name of the project. Then the pipeline creator will read the spec and create the pipeline. Now that we have the specification for the pipeline creator we are ready to activate it by calling the Codefresh CLI (i.e. using the same method of creating pipelines as the creator itself). The pipeline creator now exists in Codefresh and will be triggered for any builds that match the glob expression we have seen in the previous part. You can visit the Codefresh UI to verify that everything is as expected. Notice also the trigger that clearly shows that the pipeline creator will only run if a pipeline-spec file (in any directory) is among the modified files. description: "Docker creation for sample GO app"
The pipeline itself is very simple. It only creates a Docker image (see BuildingDockerImage step at the bottom of the file). The important point here is the trigger. 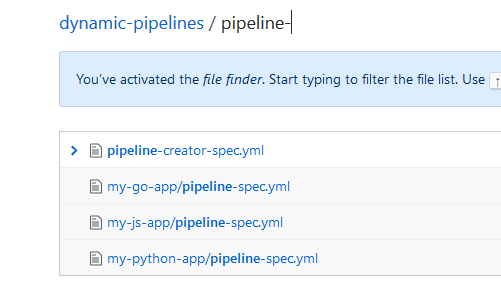 This pipeline will run only if the files changes are under the folder ‘my-go-app/**. This makes sure that this pipeline will only deal with that particular project and nothing else. Commits that run in other project folders will be ignored. That’s it! No other special action is needed. 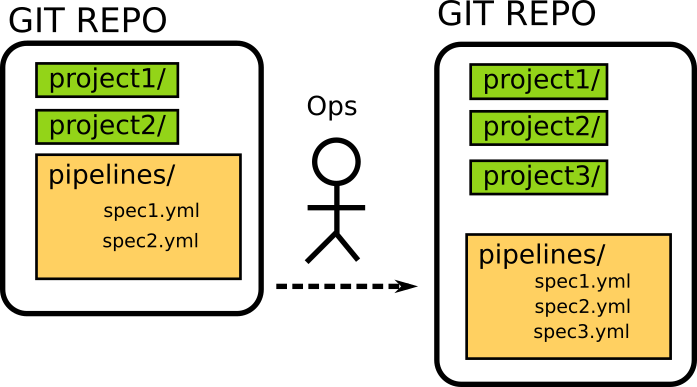 The only interaction for developers/operators to get a pipeline running is via the GIT repo. The pipeline creator described in the previous section will detect this commit and automagically create a specific pipeline for the Golang project. The person that made the commit does not even need a Codefresh account! For illustration purposes, we used the convention where the name of the project is also the name of the branch that contains the pipeline. This makes the pipeline creator simple to understand but is not always practical. A better approach would have been to have a script that looks at all the folders of the project and locates the spec that was changed. This would also make it possible to create more than one pipeline with a single commit. Also for illustration purposes, we assume that each project comes with its own pipeline spec. An alternative approach would be to have a simple codefresh.yml inside and then have the pipeline-creator convert it to a spec on the fly. This would make the creation of pipelines easier for developers that are familiar with Codefresh YAML but not the full spec. For bigger organizations, it would also be possible to have a templating mechanism for pipeline specifications that gathers a collection of global and “approved” pipelines and changes only the values specific to a project. Finally, the present article shows only what happens when a project is initially created and the pipeline appears in the Codefresh GUI for the first time. A smarter approach would be to also recreate existing pipelines, so that the operator can change several settings after the initial pipeline creation.